TODAY WE COVER Season 6 Episode 18 "Tea And Empathy"
PLOT SUMMARY: Gloucester Regiment, part of the BCFK (British Commonwealth Forces Korea) arrive at the 4077; Colonel Potter calls them nutcakes who never wear helmets. BJ is recognized by a GI, Sgt. Johnson, upon whom BJ operated 8 months earlier; he is wounded and seems to be in severe pain. Klinger has to break it to Col. Potter: their penicillin store has been stolen again. Father Mulcahy tries to be useful, but "no one seems to need Last Rites." Hawkeye rails against the British tradition of giving wounded soldiers tea. For soldiers with abdominal injury, tea may mean peritonitis. Major Derek Ross, the CO of the Gloucester Regiment, annoys the surgeons with his brusque attitude toward his men. A sergeant confesses to Father Mulcahy information about Black Market medicine; Father grabs Klinger and a jeep and Father's info rings a bell. 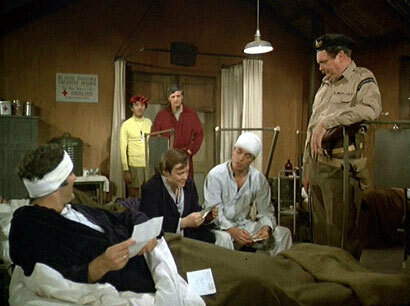 Hawkeye is shocked when he next runs into Maj. Ross in post-op. Hawkeye learns there may be different methods for different COs when it comes to command.